When you’re trying to have fun, do things on your own, or hang out with friends, it can be really hard to remember all of the rules and tips you need to follow to stay safe. This resource guide keeps everything simple, quick, and most importantly, fun. After playing these safety games, you’ll quickly remember what you should and shouldn’t do. The lists of quick tips for staying safe by the water, especially pools and lakes, will quickly become second nature for you, allowing you to focus on having fun. Using the internet also has a few rules, from keeping your personal information private to letting an adult know what you’re doing online. In the end, home safety doesn’t have to be boring, so enjoy these fun games, activities, and workbooks that make learning fun! Fires can be really scary, but there are ways to keep them from happening and to make sure you stay safe. Never use a stove, matches or lighters, or use electrical outlets without a grownup nearby. Talk to your family about what you should do if your smoke alarms ever go off, including making up a plan for escaping the house. If for some reason you get caught in a fire, stop-drop-and-roll is a classic, quick way to keep yourself safe. Basic Fire Safety From Sparky the Fire Dog–Sparky the Fire Dog is full of knowledge. Learn from the best with these games and activities. What to Do When There’s a Fire–Learn what to do when the smoke alarms go off and feel like a superhero. Top 10 Rules for Fire Safety–You don’t have to remember a ton of rules to understand fire safety. These are the most important as well as the simplest. Fun Fire Safety Games–Learn fire safety while playing games. Water is supposed to be fun, whether you’re at a pool, lake, or splashing in your bathtub at home. Even the best swimmer can get hurt if he or she hits their head. Always follow the pool or lake rules when swimming, and never go near water without an adult nearby. When you’re getting ready for bed, remember to stay seated in the bathtub at all times. Water Safety Tips by Age Group–Learn what makes certain types of water unsafe, in and outside of your home. Splish and Splash–Pool safety doesn’t have to be boring. These two characters make it fun! Learn to Swim Safely–Learning how to swim can be scary at first, but it’s definitely important. Water Safety Coloring Pages–Basic water safety tips all in the form of fun coloring posters! Pick your favorite crayons and get started! Have a Safe Summer: Water Safety Tips (PDF)–Water is supposed to be fun, and if you follow these safety tips, it will be! You can learn so much from the internet, but you can also run across some bad people. Remember to never, ever give someone your full name, address, or phone number, or to post any of that information online. If someone is harassing you, don’t be embarrassed: talk to a trusted adult right away. While bad people are one of the scariest parts of the internet, you can also face some problems with kids your own age. Learn what cyberbullying is, what to do if it happens to you, and how to make sure that you don’t accidentally become a bully yourself. Then, enjoy everything that the internet has to offer! Stop Cyberbullying: Being Kind Online–It’s easy to get carried away online. Learn proper "netiquette" and remember to treat everyone with kindness, whether you’re on the playground or a website. Cyber Safety 101–There’s a lot of freedom on the internet, but keeping an adult in the loop also keeps you safe. Learn when to speak up. Are You Cyber Smart? Find Out Here!–Take this quiz to find out where you stand on cyber safety! Cyber Safety Games and Polls–Everything’s better as a game. 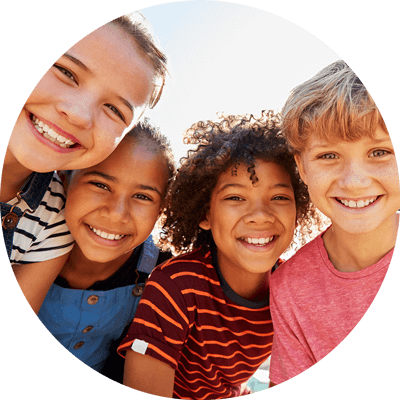 Learn cyber safety with these interactive tools, and fill out a poll to see how much you know compared to other kids your age! Talking to adults who you don’t know is never a good idea. Don’t go anywhere with a stranger and never open the door to anyone other than family or trusted neighbors when you’re home alone. Avoid getting close to any cars that pull up when you’re waiting at the bus stop, and keep your eyes peeled for situations that look like they could turn bad. When in doubt, call out and run for help. It’s always better safe than sorry. Safety Tips for Kids–This covers all of the basics, from not talking to strangers to finding help when you need it. Be Aware of Dangerous Situations (PDF)–Why you should be wary of strangers, and what you can do to stay safe. Staying Safe Home Alone–When there aren’t any adults around, safety is even more important. Learn what you need to do here. When it comes to home safety, there are a lot of things to remember. The easiest way to get a handle on all of the rules is to play fun games and do activities with friends, teachers, and adults. With these games, you won’t feel like you’re "learning" but the next time you’re in a situation online, at home, or at school, you’ll be prepared. Talk about what you learn here with your parents, a trusted adult, or even your friends. Discussing rules and safety information makes remembering it even easier! Safety Coloring Book–Safety at home, at school, and with friends, all through art! Interactive Safety Games–These adventure games make learning how to stay safe fun, and make remembering the basic rules easier than ever. Injury Prevention Workbook–Nobody wants to get hurt. These fun activities will help you remember how to keep yourself safe all while doing your favorite activities. Get Ready for Emergencies!–Disaster Master takes you through every emergency possibility, including home fires. Call 1-866-238-9934 or complete the form for a free quote.